The wall lenk (BT-4601KF) Bella Tavola fondue/chaffing burner, cooking platform & butane fuel pack is a compact, refillable butane powered burner with adjustable flame control, automatic ignition, safety mechanism turn off stopper, heavy non-tip wide base, built in pressure release valve. The Bella Tavola BT-4601KF has a wide variety of uses such as fondue pots, chaffers, stone grills, raclette sets, soup tureens, Coffee and beverage urns. Burner can be refilled with any butane fuel. 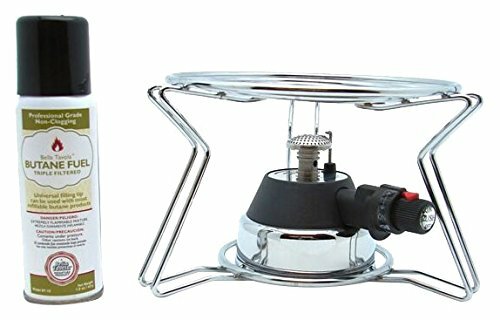 Burner, cooking platform & butane fuel pack includes butane burner, cooking platform and 1.5 oz. Canister of Bella Tavola butane fuel. The included cooking platform has a stainless steel wire design with a height of 4-1/2 inches and a diameter of 6-3/4 inches. California Prop 65 - Warning, this Product contains chemicals known to the State of California to cause Cancer, birth defects or other reproductive harm. If you have any questions about this product by Bella Tavola, contact us by completing and submitting the form below. If you are looking for a specif part number, please include it with your message.